Wagner’s operas are stunning not only for their rich and dramatic vocal lines but also for containing some of the most sublime orchestral music of the 19th century. 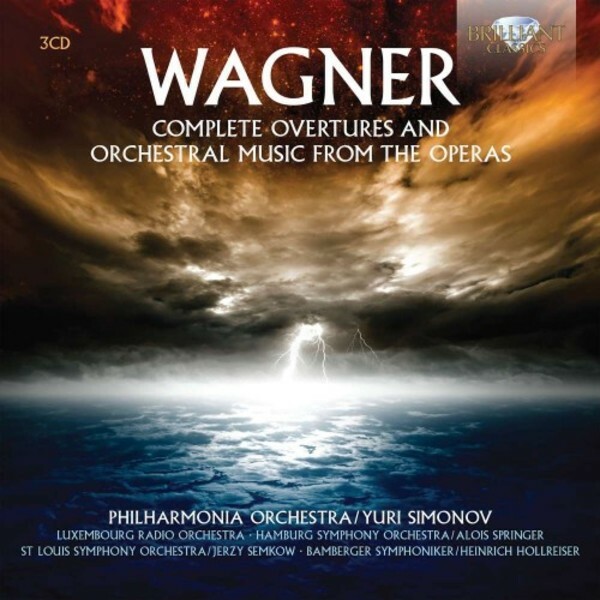 This release boasts excerpts from Wagner’s best known dramatic works, including Parsifal, Tristan und Isolde and Der Ring des Nibelungen, but also the less performed operas Rienzi and Die Feen, which both feature splendid overtures. The selection also showcases one of Wagner’s most popular ensemble works: the superb Siegfried Idyll, written as a birthday present to his second wife and performed on Christmas Day 1870. A highly personal piece, Wagner later incorporated some of the material into his opera Siegfried. The first two CDs are performed by the Philharmonia Orchestra, established in London in 1945. A world-class orchestra with thousands of recordings to its name, the ensemble is directed here by Russian conductor Yuri Simonov, best known for becoming the youngest ever chief conductor of the Bolshoi Theatre when he was appointed at the age of just 29. The final CD brings together some of the finest orchestras from across Europe, as well as the prestigious St Louis Symphony Orchestra, in historical recordings that have certainly stood the test of time.